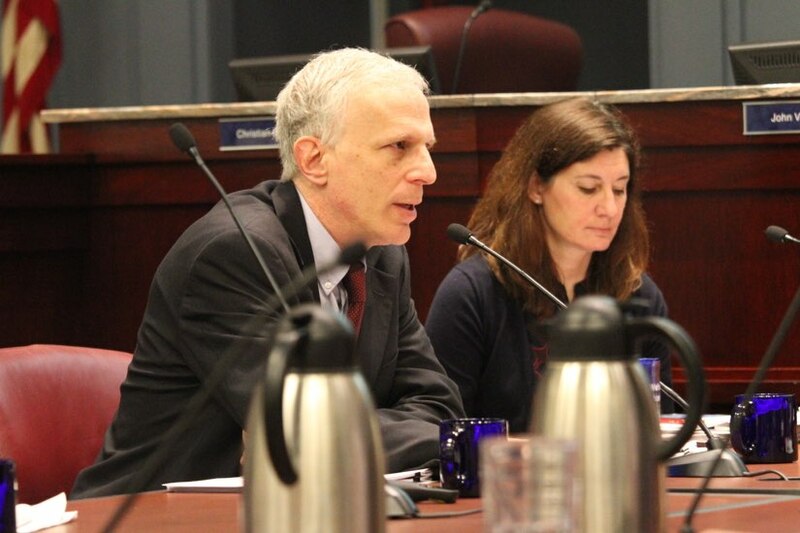 (Updated at 2:00 p.m.) More money for cops and firefighters, for economic development and for county employees — that’s the message from Arlington County Manager Mark Schwartz, who presented his proposed budget to the County Board this morning. The $1.19 billion budget benefits from a 3 percent increase in overall projected revenues, allowing Schwartz to boost funding to a number of priorities and propose a slight tax rate decrease. The budget adds $1.6 million for the addition of 19 public safety employees. Among them: eight firefighters/EMTs, six police patrol officers, and four uniformed Sheriff’s positions. The new firefighters will covert existing three-person fire units to the nationally-recommended staffing level of four per unit. The extra police officers will help reduce overtime and officer fatigue. The extra Sheriff’s positions will address staffing levels at the county jail. Schwartz allocates $1.5 million in additional one-time funding for Arlington Economic Development’s efforts to bring down the county’s office vacancy rate. Another $400,000 will be used on infrastructure maintenance like streetlight repair and residential concrete maintenance. One of the biggest proposals in terms of cost is $6.3 million to increase merit-based pay for county employees, boost the minimum wage for permanent employees to $14.50 per hour, boost the county’s Live-Where-You-Work program and replace grade and step plans with an “open range” salary plan. Arlington Public Schools, which is dealing with a quickly-growing student population, will see an extra $13.2 million — for a total of $464.9 million — in Schwartz’s budget. The budget includes separate proposals for an extra $6.2 million in projected revenue than originally expected. Among them is a proposal to decrease the county property tax rate by half a cent, to $0.991 per $100 in assessed value, saving taxpayers about $3.5 million — though many will face higher overall taxes thanks to rising assessments and a rising solid waste rate. Other proposals include adding an extra medic unit for the fire department, to address peak demand, and $100,000 to expand the online streaming of public meetings. Despite a so-so macroeconomic environment, Arlington County isn’t being forced to make tough budgetary decisions this year, unlike our neighbors in Fairfax County. Schwartz credited Arlington’s business community — which makes up about half of the tax base — for helping to smooth out economic bumps. “We’re benefitting from our 50-50 split between commercial and residential,” he said. Schwartz will formally present his budget at the County Board’s upcoming February meeting. The Board will adopt a final Fiscal Year 2017 budget on April 17. County Board Chair Libby Garvey said there’s still work to be done on the budget, but overall she’s pleased with the county’s direction under Schwartz, who last month was selected to be the county’s permanent County Manager.